Better prospects for crude oil is nowhere more evident than on derivatives markets and the shift in positioning of large-scale derivatives speculators such as hedge funds. 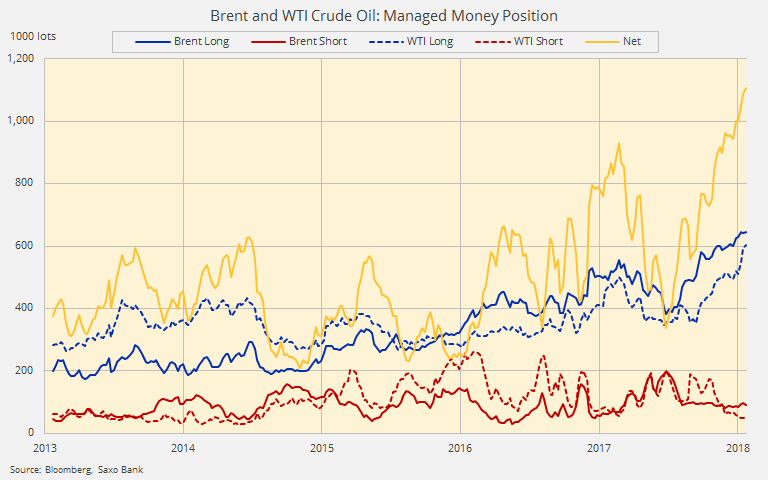 Hedge funds have pushed long positions – bets on higher prices in future – to all-time record levels across five energy markets including US benchmark West Texas Intermediate crude, Brent international oil futures, and US gasoline and diesel fuel. According to the CFTC's weekly Commitment of Traders data up to January 23 so-called managed money investors on Nymex in New York and ICE Futures in Europe now hold the equivalent of more than 1 billion barrels of oil on a net basis. That compares to lows of just over 200m barrels in 2014 and similar dips in 2015 and the start of 2016. 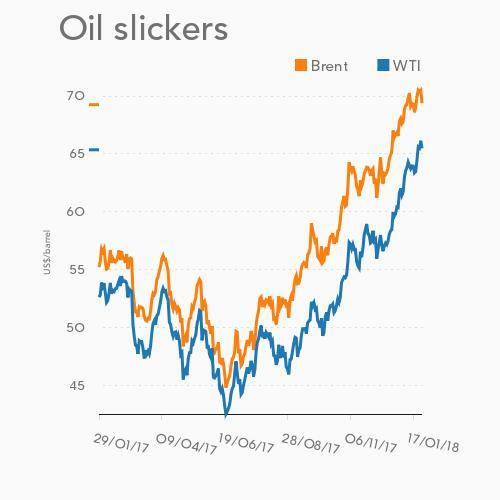 WTI and Brent have added roughly $25 a barrel from lows struck in June last year with Brent, which usually trades at a premium to the US benchmark, recently topping $70 a barrel for the first time in more than three years. The fact however remains that funds will continue to buy into strength until the music stops. This past week gave the bulls no cause for concern as the dollar weakened, worldwide growth was cheered in Davos and US crude stocks continued to decline. 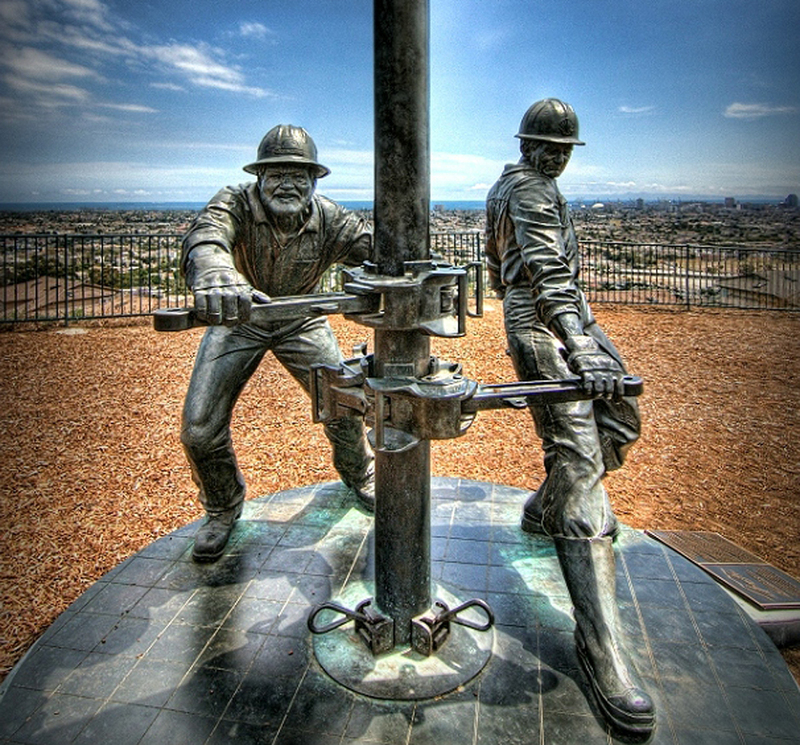 The surge in the WTI price has been boosted by a fall in oil stocks held at the Cushing hub in Oklahoma, the price point for the contract. Stocks have fallen to below 40m barrels from 64m barrels in November last year. Pipelines are running at full capacity because a number of new projects have been held up in recent years and even additional rail capacity is being fully utilised. The upshot is that stocks of crude oil in Canada have been rising rather than falling and, while global prices have been climbing, the price of Canadian heavy crude oil has remained stagnant. The discount for Western Canada Select, the price obtained by most producers in the province of Alberta, has widened to $27.70 a barrel from $9.40 in May last year. The largest gap between Canadian crude prices and WTI was recorded in November 2013, when it averaged just under $40 a barrel for the month. The record low for Western Canada select was in January 2016, when Albertan oil fetched only $16.30 a barrel (compared to $30.60 for WTI at the time).